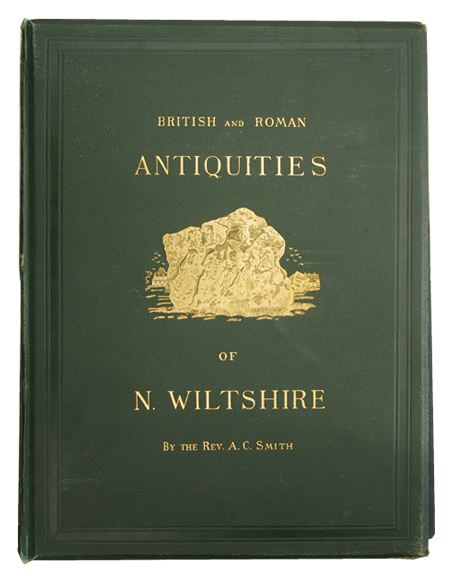 Reverend AC Smith's 1884 book British and Roman Antiquities of Wiltshire is subtitled A Hundred Square Miles Round Abury. One of the book's most remarkable features is a series of hand-drawn and colourful maps showing Smith's antiquarian discoveries - the result of his thirty year exploration of the area on horseback. Smith defined his hundred square miles with a frontispiece 'great map' showing his chosen area, with Avebury at its centre, at a scale of one inch to the mile and divided into squares one mile across . He then made more detailed maps, at a scale of six inches to the mile. Each of these maps covers six square miles, comprising three of the one mile squares horizontally and two squares vertically. Each detailed map was pasted across a two-page spread of the book and measured 18" by 12". 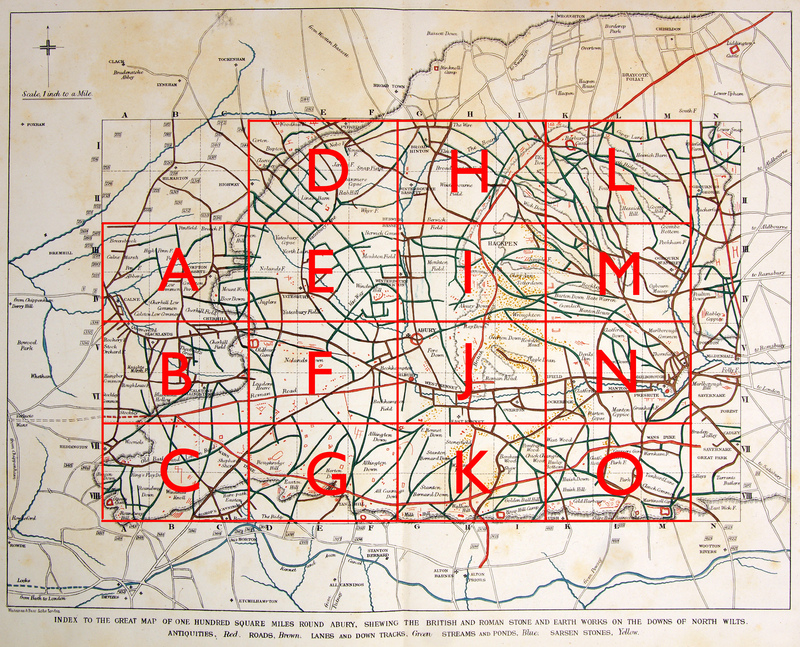 Smith's original system of letters and Roman numerals is difficult to follow, so each of the one mile squares has been renumbered, from 1 to 90. The detailed maps are now labelled A to O. Hence, the first detailed map A now features squares 1 to 6 . Avebury is featured on map J. Note that Smith's book also has three smaller maps of just two squares each, those of the easternmost vertical strip. They have not been included here. Smith describes all the features of his detailed maps. He found nothing of interest in the six squares centred around Hilmarton in the great map's north-west corner, so his detailed maps began with the area below this - re-labelled A in this web version. 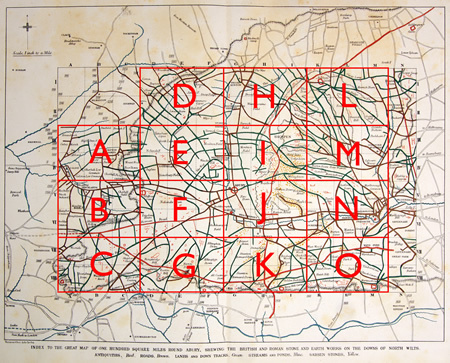 All the detailed maps show 'antiquities' such as earthworks and monuments in red, and lettered in lower case; those of each map square are then detailed individually in the text. Some are described in a few words, others in a whole page or more. There is not space here for Smith's full text, so each is summarised very briefly, in note form. Where Smith gives book references they are included, as many of his sources may now be found online. In the original, Smith included whatever information he could glean from"our most noted Wiltshire authorities on such matters in Early British and Roman times; to wit, Aubrey, Stukeley, and Sir Richard Colt Hoare". Smith's other sources included Dean Merewether, Dr Thurnam, William Long, William and Henry Cunnington, and Smith's friend Reverend Lukis. Smith began making his map shortly after settling in Yatesbury in 1852. "Seeing the downs around me becoming broken up" he wrote, "and many of the barrows fast disappearing under the plough, I began to map down such districts as were newly brought into cultivation, and so keep a record of such of the mutilated earthworks as were still recognisable." He then enlarged the map, taking the one inch Ordnance Survey as a guide and increasing the scale to six inches to the mile. Even at this larger scale, Smith found it necessary "to represent all the antiquities on the map on an exaggerated scale. This may be said generally of all the earth and stone works, but applies more especially to the barrows". 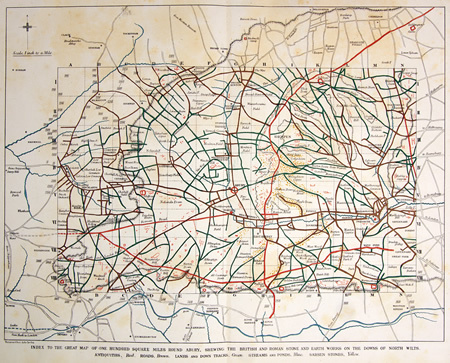 Smith added that he had also "consulted every map of Wiltshire, great and small, which I could find in the British Museum and elsewhere. They are not numerous, nor generally of much value". Above: This website's re-labelling of Smith's detailed maps. Above: AC Smith's 'Great Map'.